This might look like a TV. It’s a big 65-inch display capable of HDR and putting out 1000 nits of brightness. It even uses a quantum dot film to achieve DCI-P3 colour gamut, which is nerd speak for really good color reproduction that’s usually only found super expensive TVs. 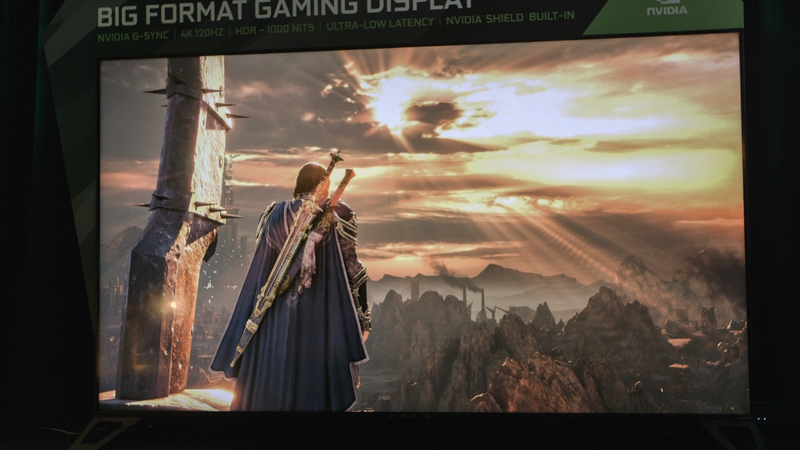 But this display is one of three new Big Format Gaming Displays Nvidia announced at CES. This thing is meant to be a gaming monitor first, and yes, shockingly, that does make a difference. The display I checked out was the HP Omen unit, but there will be displays from Asus and Acer too. They’ll have smarts built in—in this case the pretty excellent Nvidia Shield, and they’ll have standard ports, like HDMI with HDCP 2.2 support (so they can play back protected content), but they’ll also have ports not typically found on a television, like DisplayPort 1.4. The big difference, on paper, between these new 4K not-TVs and the stuff announced by companies like Samsung, LG, and Sony, is that these sets should have much less lag, which is crucial for gaming, and they should be able to maintain frame-rate fidelity far better than a television set ever could. In my experience testing TVs they tend to have anywhere from 50ms to over 200ms lag between the time you press an input on a game controller to the time it registers on screen. While Nvidia hasn’t given specific lag response times, a typical gaming monitor is well under 10ms, and often as low as 3ms or even 1ms. So, one would assume, these displays are that responsive, which makes them great for fighting games, where the milliseconds are the difference between winning and losing a match. The other key feature is related, and that’s the systems maintaining frame rate fidelity. There’s no soap opera affect on a movie unless the director intended that, and there’s no software hacks to achieve 23.97 or 24 frames per second—something that can often occur with fancy TVs that have displays with high refresh rates. 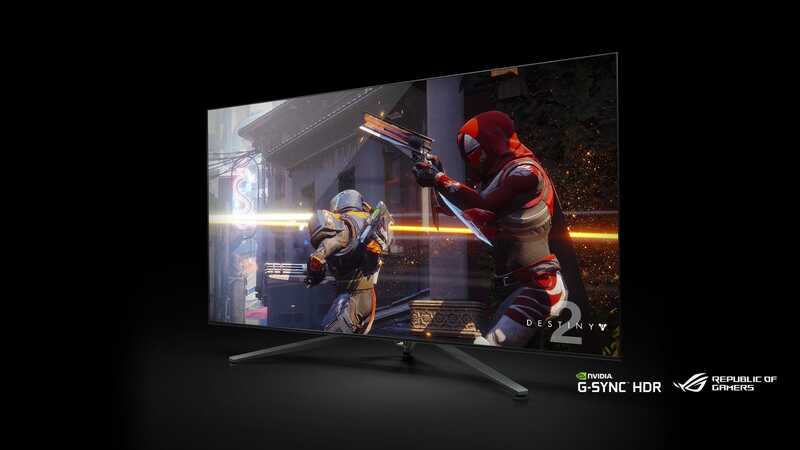 Instead, the BFGDs use G-Sync, Nvidia’s adaptive sync technology, which means they will work with the Nvidia card in your PC or the Nvidia Shield built into the display, to always give the smoothest playback possible by forcing the display to match the frames of the device instead of refreshing whenever it pleases. Last year there were rumours around the announcement of the Xbox One X that TV makers might include the AMD flavour of adaptive sync technology, FreeSync. But that hasn’t been announced yet, so these 65-inch BFGDs are the biggest displays you can get with adaptive sync tech inside. 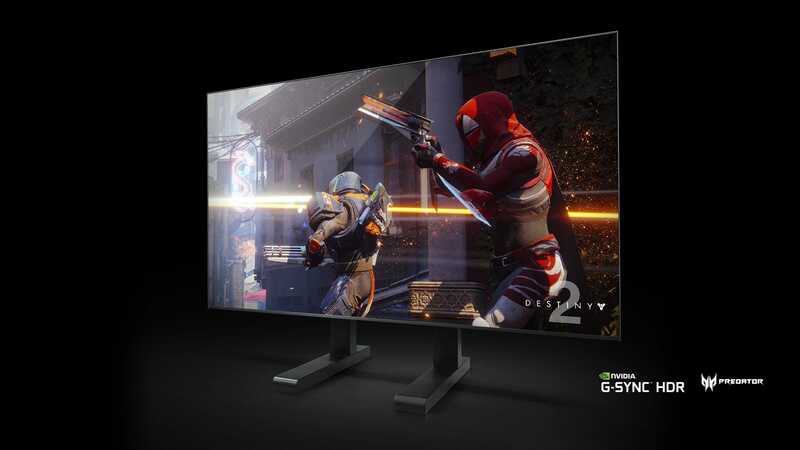 Which means they could be the best displays you can get for big screen gaming. I say could because the HP Omen unit I saw had some of the worst blooming I’ve seen on a TV. Every time something bright appeared on a dark background it had a halo at least an inch wide. It was almost disastrously distracting, and I can only hope that it was the result of this being an early unit, and not the final product. Because the idea behind the BFGDs is a really good one! Currently when you get a TV and pull it out of the box it has every single piece of whizzbang tech a TV maker can cram in. The idea is to make the picture “more pleasing” but you usually wind up with a big, bright contrasty mess that looks like garbage. Nvidia’s displays hope to be much more loyal to the intent of the creator. No soap opera effect and no overly vivid picture. That’s a very good thing, and the idea behind these sets, 65-inch 4K HDR displays with an Nvidia Shield (one of the best set top boxes available) built in is awfully appealing. But Nvidia’s choice of working with laptop and small gaming monitor makers over TV makers doesn’t feel like a smart one. A 65-inch display isn’t the same thing as the display in your laptop or even the 27-inch display you might game on. Nvidia is basically asking monitor makers to get into the business of giant TVs, and if that HP Omen set I saw is anything to go by, that is not a business they should be in. That halo issue was just way too severe, and the blacks were not nearly black enough for a high-end display. No pricing has been announced yet for these displays, so they could be anywhere from £700 to £10,000. We’ll know for sure when they are available later this year.